When visiting the Petronas Towers in Kuala Lumpur, Petrosains Discovery Center is another must visit attraction if you are traveling with kids. Tucked away in the mall that lies between the two towers, it is easily accessible and perfect for rounding out a day of fun in the area. With tons of hands-on learning activities for kids, you may have a hard time dragging them away at the end of the day. Once we arrived at Petrosains we hopped in our ride vehicle to take a journey into the Discovery Center itself. Every visit to Petrosains begins and ends with this ride unless the lines are too long, then it can be bypassed. It is a neat ride, and only lasts a few minutes. Once through, you are ready to start the fun through the various themed sections of the Discovery Center. You can watch our vlog of our visit to the Petrosains Discovery Center and the Petronas Twin Towers below, and read on in this post for additional information! The newest area of Petrosains is the Space exhibit area. Here, you can learn all about space including how astronauts live, eat and even sleep in space. The Geotime Diorama takes visitors back 200 million years to when dinosaurs walked the Earth. Unfortunately, this exhibit area was closed because they are renovating it to bring even more amazing things to Petrosains, but I am sure it would have been just as incredible as the other themed areas it been open. The SPARKZ exhibit area is probably where the boys spent the most time. It is jam packed with fun hands-on activities including a bunch of science puzzles, a live show that was going on while we were there, interactive screens and even a grain pit that kids were all going crazy over. Before heading to lunch in the Discovery Center's on-site Molecule Cafe, we explored the Speed exhibit area where the boys competed to see who could throw the fastest pitch (Jayden did by the way), Joshua tried his hand at driving a race car, and I challenged the boys to see which of us had faster reflexes. After lunch, we headed up the stairway through the Molecule Nano World to learn more about how fun chemistry can really be, and then we ended our time in the museum with a fun 3D theater film and by exploring the Digi Cyber Safe exhibit. It was refreshing to see that the Petrosains Discovery Center was featuring online safety for children. With all children having access to technology these days, it is important to teach them the dangers that lurk online. 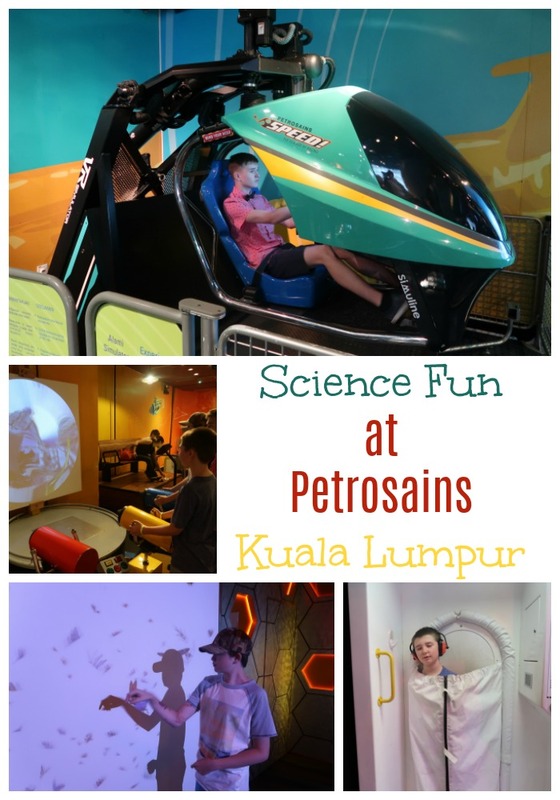 Petrosains Discovery Center was an incredible half-day of learning fun that made the perfect addition to our visit to the Petronas Twin Towers. If you are planning to visit the towers, be sure to stop by Petrosains for some hands-on science exploration. Petrosains is open Tuesday-Sunday and closed on Mondays. Admission is RM 30 for adults and RM $18 for children, which works out to roughly $7.50 USD for adults and $4.50 for children ages 3-12.